Happy Birthday Tyler! The Linden Life: Happy Birthday Tyler! Wow. I can hardly believe that this is the seventh birthday we have celebrated together! Every year I learn more and more about you, and I can honestly say that the more I learn, the more I love! You are a wonderful husband and an amazing father. Happy Birthday Tyler! 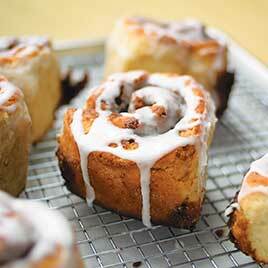 I got up extra early this morning to whip up a batch of cinnamon buns. I used a no-knead recipie from a Cooks Illustrated magazine that I got in my stocking. This was the first time I have made cinnamon buns, and I think they turned out great! Unfortunately our camera was left behind at Tyler's parents during one of our Christmas Festivities, so I don't have an authentic picture. This is what they are supposed to look like, and in my biased opinion they look even better in real life! This evening we are going out! As in, actually OUT of the house without the baby! And not to a family gathering, a birthday party, or some other 'must-do'. (Don't get me wrong, I really do love birthday parties and family dinners, but sometimes it's nice to go out on more of a date-y date.) So, tonight we are going to MTC to see a performance of Shirley Valentine! I don't know much about the story, but I love going to the theatre for any event. Tyler's parents have graciously given us their tickets and have agreed to baby-sit The Littlest Linden Thank you for the Birthday Evening Out! I will let you know how it goes.